In the days of touchscreens and wireless data, our heroes of yesteryear find solace in the companionship of one another. Here is my weak (and slightly unfinished) Atari iPod Dock. I thought sharing may create interest for someone that can do this better. 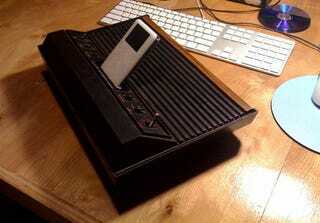 As far as specs, I gutted a broken, iPod clock radio and put it all inside the Atari. Everything works except for the clock (it was the broken part). There is even a remote control so I can sit back on my vinyl couch, drink some Tang and control my tunes...And yes, I'm still rocking a 3rd gen iPod. A little geek factoid about that generation of iPod: It's still Jason Chen's, Matt Buchanan's and my favorite iPod design. Those orange glowing buttons were the best.